This past weekend Kelly and I made the great escape to South Texas for wedding extravaganza! What an amazing weekend! I can't think of anything better then sleeping on the beach, lounging by the pool with my favorite people and being treated like royalty throughout the fantastic wedding affair. Vacation? Yes, please. The wedding will have it's very own post soon! I spent so much time preparing for our trip and talking to Molly about life at Nonnie's that I thought I had covered all my bases. Apparently, I had forgotten one very important member of the family. Last night was Milo's most intense love fest ever. Anywhere we were sitting he HAD to be. He even purred when Gabriel sat on him. 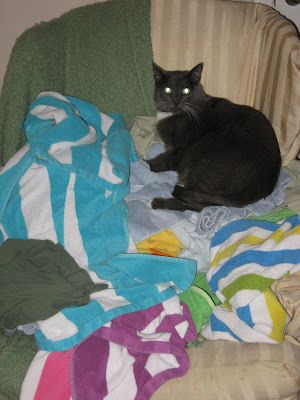 Late in the evening I looked over at our clean stack of laundry to see Milo atop Mount Beach Towel... purring and pretending that he too enjoyed a trip to the beach. While the weekend was a blast it is GREAT to be home and feels a little nice to have been missed...well, by the cat at least. I love it! Romeo missed us as well and was extra sweet and full of hugs too. Sometimes I think Romeo could care less, but he knows who is family is!